I’ve been using Wikipedia since 2004, but I haven’t been active lately. My excuse: Busy taking care of my kids. 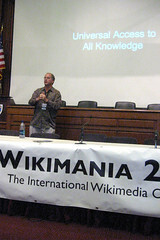 However, Ivan Lanin dragged me back into Wikipedia world, by arrowing me as the secretary-general of Wikimedia Indonesia, so I have to slowly get involved in wiki again (To the Indonesian wiki community: please be kind, I’m sort-of new here). At the same time, little Kei began to join a preschool, so I started to get myself busy with things, which necessitates me to reorganize myself. As you might have known, my memory capacity has been somehow impaired after going through a severe bleeding during child birth. I theorized that it was caused by the reduce blood flow into my brain when my blood volume was cut by more than half. So, I’ve been a junkie in logging and tracking stuff, such as tracking my expenses and time spent. But how about other take note of other things? How to help remember things? How to organize “My Personal Knowledge”? I tried Freemind, but somehow it loses focus when the mindmap gets really big. I tried Personal Brain, but I got tangled in branching nodes while I didn’t get to input much information there. So I decided to give it a try. First, I tried to install MediaWiki on my Dreamhost server. It was easily done, thanks to Dreamhost one-click install. Then I simply modify LocalSettings.php to make it private, and as another layer, I password protect the whole directory too. But thanks to Indonesia’s slow internet access, going to my online personal wiki takes ages! Often, my thoughts vaporized into the sky before the wiki page opens. So I thought, the installation has to be local. Technically it is easy. First, install XAMPP, then install MediaWiki. I tested it and it seems great. MediaWiki offers great flexibility in putting and organizing my thoughts / notes. Each thought / word / notes got one dedicated wiki page, and it can be tagged by using Categories. The categories can be arranged in many different ways to suit my organizational style. I’ve been using this for two weeks. Interestingly, I use it initially as contact database. There, I put one page for each person with complete contact details, info, history of meetings and correspondence. Then this person’s page is then linked to a different page containing the information of his/her workplace, another page for minutes of meeting, and another project page for project details. I found that MediaWiki is more flexible in putting information about a person compared to the Notes field in Microsoft outlook, and the big plus is that the person’s page can be linked to other things such as minutes of meeting, etc. You can’t do this in Microsoft Outlook contact, so, I use the MediaWiki database as a complement to my Microsoft Outlook database. MediaWiki as reference repository (contact history, minutes of meeting), while Microsoft Outlook as the workhorse from which I send out emails, arrange meetings, calendaring, etc. In sum, over these past two weeks, I found out that MediaWiki has been a great tool to take notes, to organize my thoughts, and to link one piece of information to another. It is very flexible (although not as graphic as Freemind or Personal Brain), and it is very much expandable (I began from contact database, and expanding into minutes of meetings. Later I might use it for putting references and project notes). It is like my personal meta-brain. So far it really helps my impaired memory. But then another problem arises. Indi and I work from four different computers each day. Two computers at work, two computers at home. It’s nice to have access to the same MediaWiki database from all these different computers. There are three alternatives to solve this problem. First: sync the whole XAMPP folder to different computers through external hard disk using SyncBack software. But this has to be done manually. Doable, but painful. Second: Put the XAMPP MediaWiki installation to a thumbdrive and run from there. Not as painful as the first one. Third: Put the XAMPP MediaWIki installation to sync on-the-fly by using DropBox This is the best option so far, since I don’t have to think, and the files will be synced. However, big caveat, the downside is that the initial sync will take a long time, thanks to Indonesia slow internet access, because XAMPP + MediaWiki installation equals about 270 MB of data. It took me 18 hours for the initial sync. But the good thing about DropBox is that it will only sync the file difference every time we make changes. So the subsequent synchronization is very easy and fast. But it is not the end of the problem. After being able to sync across computer, how do I ensure that the database is safe and secure? Restricting access through MediaWiki interface is not enough, because the MySQL database is still accessible by file browser locally. Luckily, there’s an easy solution for that. Enter Truecrypt. With it, I simply make an encrypted file container in which I put the whole XAMPP + MediaWiki database into it. This encrypted file container is put in My Dropbox folder, so that it will be synchronized on the fly. Then, each time I want to run XAMPP, I have to mount the encrypted file container by entering a password. The file will be mounted as a drive under My Computer. Then I can run XAMPP. The good thing about running it through Truecrypt, is that XAMPP will get root folder under the computer drive, so that I can run XAMPP directly without having to run XAMPP installation. So here goes the step by step, more to help me remember, and hopefully it’s useful for you too. It will take around 30 minutes to install. If you want, you can add .htacess file to enable Clean URL. Dismount drive X:/, and if you’re connected to the net, Dropbox will instantly upload the Truecrypt volume. The first upload will take a long time. Access MediaWiki with your browser, do whatever changes you want. Alternatively, if Dropbox is not an option, you can use USB drive by creating Truecrypt volume inside it, and following the steps to run xampp as above. This way, you don’t sync between computers, but you will always depend on the USB stick if you want to access your database. You need to install TrueCrypt in all the computers that will access your MediaWiki database. True,. In the meantime I use a USB drive that I trust, I believe that in order to really backup and encrypt your files you should also think of the consequences of others finding the external secure flash drive.